class is lively, energetic, fun! Before a person moves, they send living energy, or Ki, in the direction they intend to go. By having a calm mind, the Ki-Aikidoist senses the movement of Ki and responds initially to that, rather than to the movement of an opponent's body. It is a simple matter from there to lead the opponent's Ki so the opponent falls safely to the ground. "Ki-Aikido" means "the way to union with the Ki of the Universe." Ki-Aikido is based on leading an opponent's Ki rather than colliding with, or overpowering, his or her body. Strength in Ki-Aikido is a matter of strength of mind in applying Ki principles, which are taught in Ki Development class, to the martial art. Because of that, relative size and muscular strength become less important. After a few minutes of warm-up exercises, the instructor will begin teaching a particular Ki-Aikido art. The art gets broken down into steps. Students pair off to practice what has just been taught until the entire art is put together. 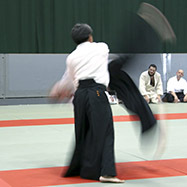 A Ki-Aikido art consists of one person attacking and another person performing the Ki-Aikido technique. 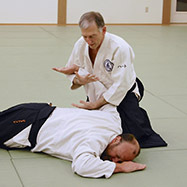 Since the result of every Ki-Aikido art is for the attacker to fall to the ground, it is necessary to learn how to fall safely where you are led. These skills are taught at the pace you are able to learn them. Other students in the class train with you in respect of your abilities in this area. Ki-Aikido training is such that students of all levels of experience can train safely together, and learn from each other. The successful execution of an art is dependent on how well you are concentrating at the moment, not on how many times you have performed the technique in the past. You may start attending Ki-Aikido class at any time. Please contact the dojo in advance and let them know you wish to visit. Your first class will be treated as an introduction at no charge to you. Upon your arrival, you will be asked to fill out a registration form. You may fill one out online ahead of time and bring it with you. Attire for the first class is a cotton T-shirt and warm-up pants that cover the knees. Students who choose to continue training are encouraged to wear a special uniform called a gi, that makes training much easier. This uniform is available for purchase at your local dojo for a nominal price. 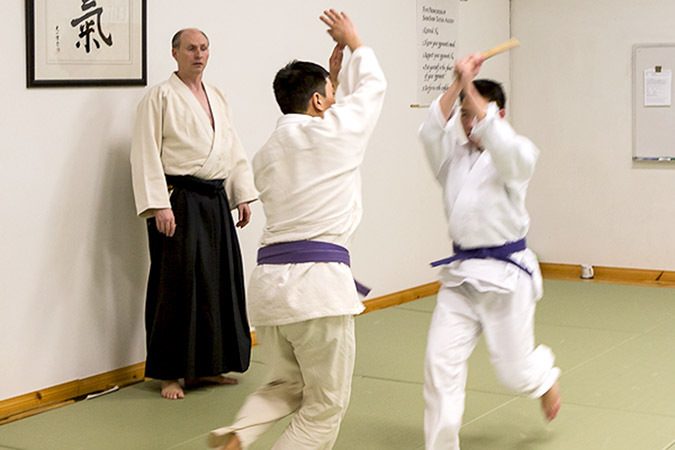 Persons who attend Ki-Aikido class must also attend Ki Development class.